Security is extremely important to A-Access Lock & Key. That’s why our Emergency Locksmith in Charlotte NC provides you with 20 important stats you need to know. We all know what burglars are, and it’s pretty safe to say that nobody wants them anywhere near their homes. However, many of us seem to overlook certain stats. For example, do you know that 50% of looters live within a 2-mile radius of the homes they invade? You should also be aware that a thief may have already stepped into your home at some point, either when they were repairing your toilet or delivering a package. Surprised? Check out this infographic for more. A-Access Lock & Key thanks Link Interactive for this infographic. 1. The majority of thefts are committed by males under 25 years old. 2. 85% of break-ins are committed by non-professionals who try to scope out easy targets, such as homes and residencies without proper locks. 3. The most common tools that pilferers will try to use are screwdrivers, pliers, pry bars, and hammers. 4. 56% of thieves are White, 31% are Hispanic, and 9% are African American. 5. 95% of people who break and enter are Male. 6. 50% live within 2 miles of the homes they invade. 7. 67% commit non-violent invasions and don’t carry any weapons. 8. The average thief will commit their crime in less than 12 minutes. 9. Kleptomaniac criminals have regular jobs too. They may have already entered your house when they repaired your cable or delivered your last package. 10. Robbers who also work as service occupations often ask to use your bathroom so they can unlock or disable windows for future entrance to your house. 11. Trespassers HATE surveillance cameras, and will usually stay away from homes that have them set up. They hate locks, too. 12. Larceny occurs every 15 seconds in the United States. 13. 90% of housebreakers gain access from either the front or back door, so be sure to install locks in your back door as well. 14. Raids typically occur between 10 AM to 2 PM. 15. On average, a theft results in a loss of $1600. 16. About 30% of robberies are an unlawful entry. This means the housebreaker gained access without having to use force, probably because there were no locks or other security systems set up. 17. Nearly 66% of all thefts occur in homes, proving the need for a good residential Locksmith. 18. Less than 15% of all pilferages are solved. 19. 85% of robberies occur in large metropolitan areas such as Charlotte. 20. Residencies without a home security system are 2-3x more likely to be targeted for larceny. That was our Expert Locksmith analysis. Keep this data in mind because these stats might come in handy. You should know that Charlotte has one of the highest crime rates in America (42 per 1000). More than 83% of communities in North Carolina have a lower crime rate than Charlotte. You have a 1 in 23 chance of being a victim of property crime or breaking and entering in Charlotte. This is all according to Neighborhood Scout. Is this cause for concern? Possibly. However, as the last of the burglar profile facts notes, a good home security system including high-security locks can help thwart intruders, raiders, and cat burglars in their tracks. Now that you know the profile of the typical house thief, you need a quality locksmith to help protect you. You shouldn’t have to run the risk of losing valuable items being stolen or your family’s life getting threatened. Asking a Locksmith company like A-Access Lock & Key to install high-security locks in your home greatly increases its safety as these locks resist trespassers and attacks a lot better than conventional locks. A-Access Lock & Key offers commercial and residential Locksmith services for people in Mecklenburg County, Union County, and other neighboring areas. Lock your business or home up tight. Just give us a call at 704-545-5410 and we will be on our way. In order to protect your home, and more importantly, your family, you need to have a good enhanced locksmith and security specialist, such as the experienced and trusted expert Locksmith Charlotte NC team at A-Access Lock & Key. Choose a reputed residential Locksmith like A-Access Lock & Key to keep your home safe and secure. We have been keeping people, homes, and offices in and around the Charlotte area safe and secure for over 20 years now. You can get a free estimate from A-Access Lock & Key, Charlotte’s #1 Expert Locksmith. Choose A-Access Lock & Key. We are the key to your security! Call us at 704-545-5410 right away! 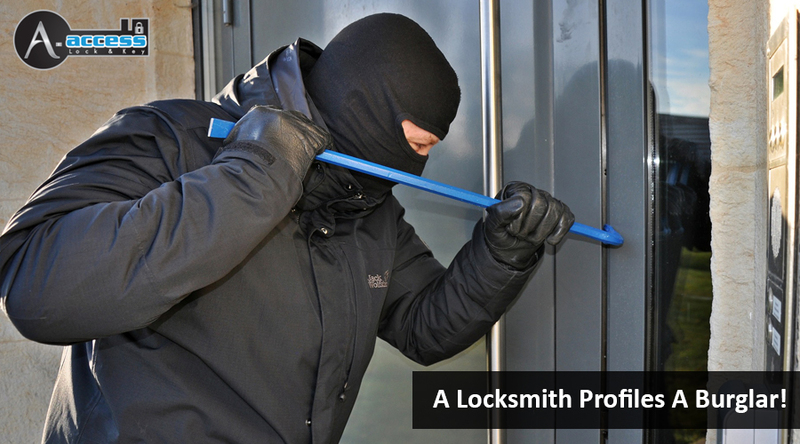 Ward off Burglars and secure your premises through our Expert Locksmith services!